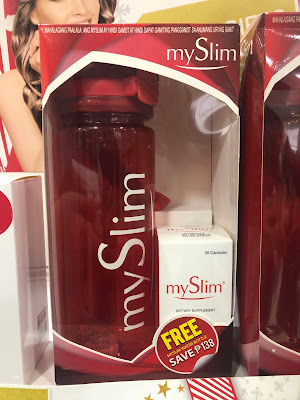 Even if there are several products on the shelf, Myslim instantly caught our team's attention. This slimming brand offers a custom water bottle for every purchase of their slimming capsule. This is a good strategy as the promo gift complements their products. The item is practical and useful. These water bottles are lightweight and easy to carry which is very ideal for athletes, travelers, commuters, and for people who are always on the go. Aside from that, these reusable water bottles help save our ecosystem by putting an end to single-use plastics. Myslim's water bottle is made from high - quality plastic. These are BPA-free that are hard to break. What makes this custom water bottle the perfect on pack gift? Practical - Useful on pack gifts are more likely to be used by customers. This means stronger brand engagement which is very beneficial for the brand. Customisable - This gift with purchase is highly customisable which is great for marketers. This must be the strongest point of this promotional item. Affordable and Safe - The raw material for making this water bottle is abundant and readily available. This means that you don't need a big budget to promote your brand. Aside from the fact that it's cost-effective, the material passed all safety test. Therefore, the brand ensures that they are producing a safe, non-toxic item for their customers. Why should your brand use a custom water bottle as your next marketing campaign? Myslim's marketing strategy should be your next marketing campaign. It is affordable and effective. It definitely helps the brand realise their marketing goals. And as mentioned, it is highly customisable. Therefore, your brand won't have a hard time creating a marketing giveaway that represents the brand. Aside from using them as on-pack promos, brands could also use them for events such as concerts, symposium, or tradeshow marketing. Because these items are something customers can use which further promotes brand promotion. Overall, this is something that your brand should use anytime soon. Giving something to your customers leaves a good impression and strengthens your relationship with them. In fact, a lot of big brands are utilising this marketing campaign. So if this item interests you, why not call our handy team right now. We are a team of experts that is always ready to answer your marketing and manufacturing queries.